Richard Muscio gives his listeners a peek into his life. In a fascinating show, he explaining what he does as CPA. He specializes in risk mitigation for family offices and save families time by utilizing a vast and vibrant network of complementary resource providers. Beyond that, Richard delves into how a battle with blindness transformed him into an avid long distance runner and co-founder of the “Move Your Feet Before You Eat” foundation which hosts the O’side Turkey Trot each year and has raised over $270,000 for non-profits that benefit Oceanside residents. 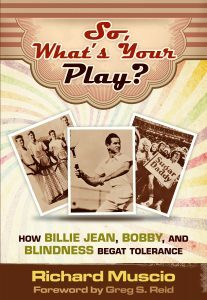 He also talks about how a young 14-year old boy became the scrapbook maker for Bobby Riggs and how he ended up having a front row seat to the Battle of the Sexes tennis match. Because of that experience, Richard became a consultant on two recent films about the event. He has also discussed how these events prompted him to write his best selling book.